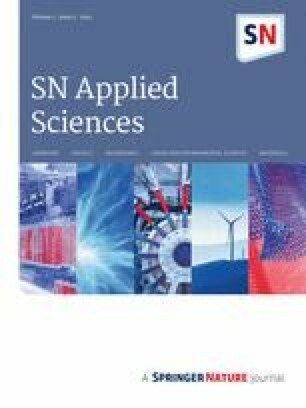 In this study, the EDM process was used to investigate the machining properties of Al–5.3% CU–SiCp–Al2O3p aluminum composite, including SR, MRR, and TWR. Input parameters consist of two electrical and non-electrical category which relates to EDM settings and the composite variables including volume fraction and size of silicon carbide particles in nano and micro scale. SEM and TEM were used to investigate particles and the base metal. Surface roughness measurement device and ball milling was used to measure and make MMC. The results show that increasing the volume fraction and the size of the reinforcing particles led to decrease in the material removing rate, and increasing in TWR and SR. During electrical discharge machining of Al-MMC with 5% SiC reinforcement, reducing the particle size from 40 μm to 100 nm resulted in approximately a four-fold increase in the material removing rate and 25% reduction in the tool wear. 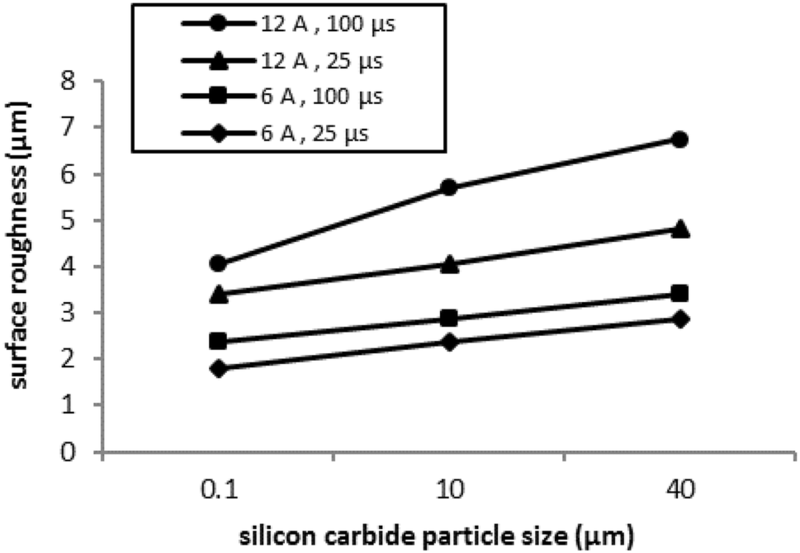 Besides, SR in 5 vol% aluminum composite samples consisting of 100 nm size particles has improved the surface quality for approximately five times in comparison with that of 20 vol% aluminum composite samples with 40 μm the particle size. Composites are materials made from a part called a base metal and at least one component called reinforcement. Composites have properties that are not found in any of the base metal and reinforcement phases merely. Among the composite materials, the metal base composites are essential because of their unique properties. Today, these materials are considered by manufacturers because of their properties such as high strength, low weight, wear resistance and high corrosion resistance [1, 2]. According to studies on the construction of composites to increase the strength and mechanical properties of the composite, one of the methods is to increase the volume fraction of the reinforcing particles. This method is prevalent and rarely uses other techniques for strengthening. Manufacturers of this material increase the volume fraction of reinforcing particles in the phase of the base metal to increase the strength of composite materials, ignoring the fact that increasing the volume fraction of the reinforcing particles in the phase, poses a challenge to the machining of these materials [3, 4]. This issue has led the industry to face a different problem. In other words, to increase the composite performance, the volume fraction of particles is increased, and on the other hand, with the increasing volume fraction of the particles, the process of forming and machining of these materials will be faced with difficulty. There are various methods for machining this type of materials . In the past, traditional methods of machining have been used for these materials, due to the existence of hard ceramic constituents in the field of these materials, conventional machining techniques, faced a significant challenge. Very high corrosion of the tool in machining of these materials made traditional machining techniques non-economic and inefficient . Yan et al. investigated the effect of the parameters of the pulse current, pulse time on the MRR,1 the TWR2 and SR3 using the EDM4 process on aluminum composite (Al 6061) with aluminum oxide reinforced microparticles (Al2O3). They observed that the pulse current had a significant effect on the TWR and also current and pulse on time have significantly affected the SR.
Satishkumar et al. studied the effect of wire electrical discharge machining (WEDM) on the MMC.5 The composite was made of aluminum composite (Al6063) reinforced with silicon carbide particles. Input parameters consisted of pulse-on time (TON), pulse-off time (TOFF), gap voltage (V) and wire feed (F) and output parameters were MRR and roughness of the work surface. Also, one of the input parameters effects was a study on the volume fraction of the reinforcing particles. The results showed that by increasing the volume fraction of silicon carbide reinforcing particles, the MRR decreases and the SR increases. As the voltage increases, the MRR increases. They showed that by increasing the pulse on-time, pulse off-time and wire tools feed rate, it leads to an increase in composite’s MRR. Mohan et al. 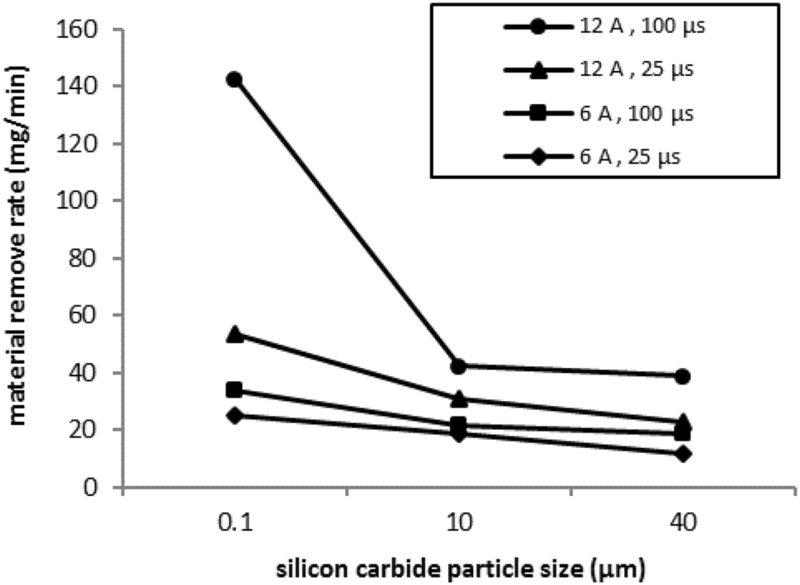 studied the EDM of aluminum composite that reinforced with silicon carbide particles (SiC). They investigated the effect of the current and volume fraction of reinforcement particles on the MRR, TWR and the SR of the workpiece. It was observed that increasing the pulse current and reducing the volume fraction of the reinforcing particles, resulted in a reduction of the MRR. 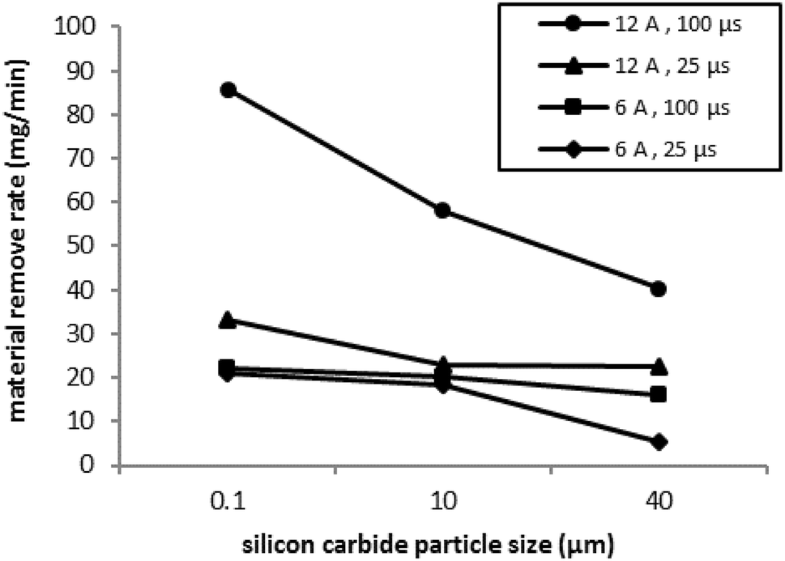 Also, the volume fraction of composite constituents had a reverse effect on the tool wear and SR.
Kumar et al. conducted mechanical evacuation machining of a hybrid metal composite material. 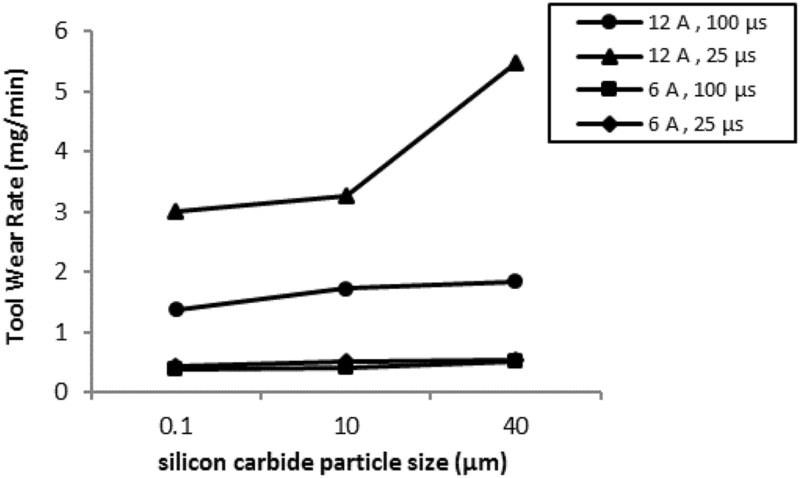 The material used as a piece of aluminum composite (Al6063) was reinforced with silicon carbide particles, aluminum oxide, and graphite, as well as a selected copper tool. They believed that metal-based composites were materials that, by preserving mechanical properties, could reduce costs and make them more affordable. The results obtained from empirical experiments for the parameters of MRR, TWR and SR show that hybrid metal-based composites can be highly efficient in the industry. The setting that influences MRR is the pulse current, and also electrode rotational speed and fluid pressure parameters have less effect on the MRR. Also, TWR increases with increasing pulse current and dielectric fluid pressure. Furthermore, by increasing the pulse current, the SR parameter raises and finally by increasing the rotational tool speed and the strength of the washing fluid, the SR decreases. Purohit et al. represent the EDM with a tube-shaped tool and a metal base composite with 10% of reinforcing particles. The material was made of aluminum composite (Al7075), reinforced with SiC particles, and the input parameters included the size of reinforcing particle, the tool rotational speed and diameter of the tool hole and also output parameters included MRR and TWR. The results of the experiment show that with the increase in the reinforcing particles size in the phase, the MRR and TWR would reduce. By increasing the diameter of the hole in the tool, MRR increases, and TWR decreases and also by increasing the tool speed, MRR, and TWR increases. Adrian et al. studied the effect of the pulse on and off time and pulse current parameters on the MRR, TWR, and surface quality. They found that among the input parameters the pulse current had the most significant effect on output parameters, especially on the MRR. By increasing the pulse current and pulse off time, the material removing rate increased, the authors concluded that low pulse currents should be used to create a high-quality surface. 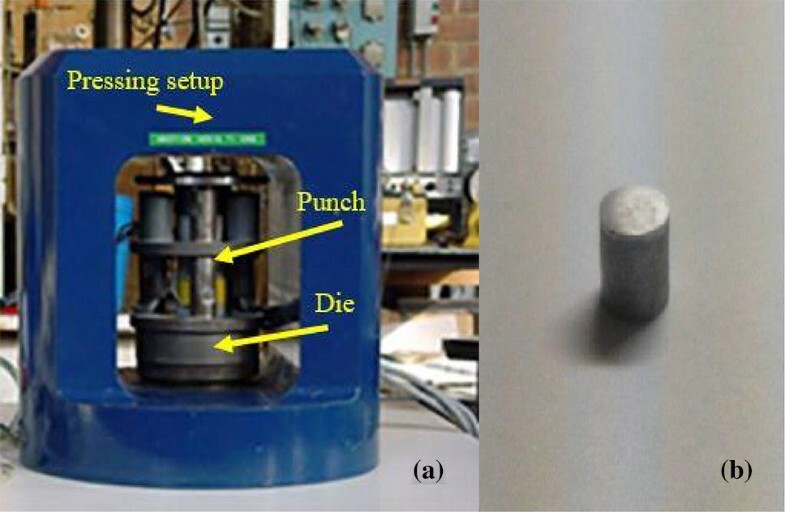 Gopalakannan and Senthilvelan  studied the effect of the pulse current, pulse on and off time on the material removing rate, tool wear, and roughness of the sample surface. They concluded that pulse current and pulse time parameters significantly affected the material removing rate. By increasing the pulse on time, the MRR of the substance increases. Also, in the high values for the pulse off time, the TWR was reduced. Pramanik et al. 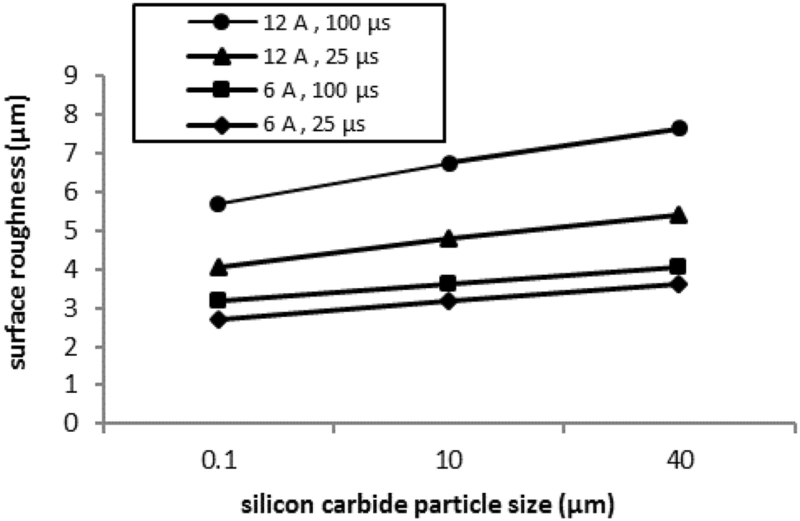 investigated the effect of reinforcement particle size in the composite in EDM. They showed that the parameter of the reinforcement particle size in the phase has a significant impact on the machining mechanism and the method of corrosion of the wire tool. They believed that the input parameter of the reinforcement particle size could affect some of the parameters, such as the wire wearing ratio in wire cut machining. Based on the previous studies [6, 15, 16], there is a gap in the comprehensive understanding of the possible relationship among volume fraction of reinforcement particles of composite material and particles size effect on output parameters of machined parts in EDM process. In this study, in order to increase the MRR and surface quality and reducing the TWR, different settings were compared with each other to obtain optimum status and the effects of the volume fraction of reinforcement particles and especially the size of particles in micro and nanoscale distributed in the composite, were examined by EDM process. To make the Al–5.3%CU/Al2O3–SiC hybrid compound, the gassy atomized aluminum powder with an average grain size of 20 μm and purity of 99.96%, was used as a base material. A copper element as a binding phase, and an aluminum oxide powder (Al2O3) with a medium grain size of 37 μm and silicon carbide powder in nanoscale (100 nm) and also in 10, 40 μm in the phase were used as composite reinforcement particle. They mixed according to Table 1, and Fig. 1 shows the base metal morphology and reinforcement particles. An ultrasonic mixture was used to homogenize powdered Al, Cu, Al2O3, and particles. To make composite compounds in different volumetric percentages, a bottle of ethanol put under the ultrasonic mixer, the powdered elements were continuously added to the solution and, after mixing operation, it placed in the furnace, and a composite powder compound with a uniform distribution of reinforcing particles obtained. A high-energy planetary mill was used to combine Al-phase particles with Al2O3 and SiC reinforcing particles. The speed of the stirrer adjusted to 250 rpm, and for performing the process in the best condition, balls of 15 and 20 mm diameter used so that the weight ratio of the ball to the powder was chosen as 5:1. The milling time was 5 h, and the volume of the 250 mm was selected for the chamber. Also, in the ball milling operation, Stearic acid was used to prevent particle agglomeration. Powdered composite samples were dried out after mixing. Figure 2 shows the mold and equipment of the powder metallurgy process and the preparation of the samples. At first, a certain amount of pulverized Powders put into a mold made of hot-work steel H13, then this mold set under a press to apply cold pressure to the sample. Then the sample was placed in the furnace to make the sintering process. In this research, the compression pressure was 250 MPa in all samples. Then the mold is placed in the furnace, and the furnace temperature has risen to 480 °C, the hot pressure is equivalent to 100 MPa on the powder sample, and it kept constant for 30 min. The samples cooled in the air condition than the unit reached the ambient temperature, finally, the samples were taken for analysis to examine the distribution of the particles in the base metal phase which shown in Fig. 3. The final composite pieces that prepared for EDM operations were cylindered 20 mm in length and 10 mm in diameter. As indicated, the machining operations of the electrical discharge were prepared by a copper rod at 20 mm in length and 14 mm in diameter, and the face of the tools polished in 0.8 µm. The number of samples and tools were equal in 36 pieces, and for the machining of each composite sample, there was a single copper tool unique to each composite sample. The machining was performed on CHARMILLES ROBOFORM 200 with oil base dielectric in the immersed state, and the parameters considered as input was divided into two sections of electrical and non-electrical parameters. The electrical input parameters, i.e., pulse current and pulse on time that each of them selected in two levels, and the non-electrical input parameters, the volume fraction and the size of the reinforcement particles, each of them were chosen in three levels. The experiment has four input parameters that numerically listed below in Table 2. Also, the output parameters including the material removing rate (MRR), computed according to Eq. 1.
where Wb (mg) is the weight of the sample before machining, Wa (mg) is the weight of the sample after machining and t (min) is the machining time. The TWR is another output parameter obtained by Eq. 2.
where Tb and Ta are the weight of tools before and after machining, and t is the machining time. Due to the high machining speed and MRR, the machining time was chosen at 5 min. The experiments were carried out in full factorial, and the parts were weighed after the machining and drying of the samples and related tools. It should be noted that the weighing operation was carried out using a digital scale of 0.0001 g for tools and all composite parts. By obtaining data from the weighing process and machining time, the MRR and the TWR was also calculated . The critical point to be noted here is that the drying process of parts in the furnace for 24 h after machining and before the weighing process, to avoid the moisture does not interfere with the results. After preparing parts by the powder metallurgy method to machining by the EDM, parts face lathed to make perpendicular to their axis; then they polished in water to create a smooth and flat surface. After the EDM process, the roughness of the surface of the composite samples was measured using the Maher Perthometer M2 roughness meter. As shown in Figs. 4, 5 and 6, with the increase in the volume fraction of the reinforcement particles in the phase from 5 to 10% and up to 20%, there is a significant reduction in the MRR of the composite which is in good conformity with earlier research [18, 19]. The reason for this phenomenon is that, because of the nature of the composites, the reinforcing particles in the base metal phase act as shields and protectors against sparks and they prevent the removal of the phase material. This effect will be intensified by increasing the size of reinforcing particles and finally will reduce the machining rate. Also, the reinforcing particles, due to their electrical and thermal property, play the role of insulation in the composite. As the percentage of reinforcing particles in the matrix increases the electrical conductivity of the composite decreases, by reducing the conductivity the generated heat will also be reduced. In fact, by decreasing the conductivity of the electrical and thermal energy, the amount of applied spark energy will also drop and, due to this incident, the TWR will be raised. Besides, increasing the size of the reinforcement particle resulted in a reduction of the material removing rate. As shown in Figs. 4, 5 and 6, by increasing in the size of the reinforcing particles from 100 nm to 10 µm and up to 40 µm, the MRR has declined considerably. The reason for this phenomenon can be sought by the fact that the required amount of energy for ejecting the nanoparticles from the base metal is far less than that of required for micro-sized particles. Therefore, the MRR in the EDM process of composite materials with nano-reinforcing particles is higher than that of associated with the composite metals having the micro-size reinforcing particles. Figures 4, 5 and 6 shows that the machining rate has a direct relation to the pulse current (I) . The reason is that with increasing spark energy according to Eq. 3, the generated heat in the plasma channel increases and as a result, the concentrated temperature on the surface of the samples increases significantly. Therefore, due to this heat production, a bulk boiling phenomenon occurs and the amount of material that is molten is removed from the surfaces of the electrodes. Valuable information about this phenomenon could be found in other studies . where E is the spark energy, Ton is the pulse duration, and I is the pulse current in the electrodes gap and V is the voltage during the process. This argument is also applicable for an increase in pulse on time, so that, according to Eq. 3, the amount of energy generated in each discharge increases with the increasing pulse on time which leads to higher MRR. Figures 7, 8 and 9 shows that the particle volume fraction has a direct impact on the TWR since with the enhancement in the volume fraction of reinforcement particles, the contamination in the gap space would be developed and causes an increase in the occurrence of arc sparks. This phenomenon leads to development in the plasma channel, and because the melting point of the tool is lower than that of the composite being tested, it results in the melting of an extensive part of the surface of the tool and ultimately causes the enhancement of TWR. Particles in the base metal phase are also an obstacle in the way of electrons and disturb the removal of material from the surface of the samples. This phenomenon is due to the increase in the temperature of the plasma channel and, as a result of the collision of the electrons on the surface of the tool, the TWR increases proportionally with the machining rate of the samples. 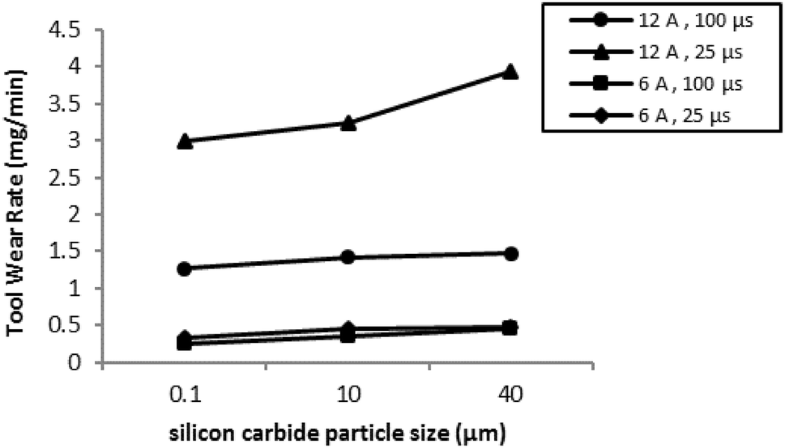 Not only the reinforcement particle size disturbs MRR, but also it has a destructive effect on the TWR. Also, according to Figs. 7, 8 and 9, the impact of the size of the reinforcing particles on the amount of TWR is higher in the high pulse currents and the low pulse on time. In other words, when the pulse on time increases, the positive ions, and negative electrons interaction pushes toward the positive ions in the channel, which means that the positive ions in the plasma channel form the dominant phase in the motion of the electrons. Furthermore, because the positive ions contain higher mobility of negative charge electrons, they will have more Kinetic energy in the channel and when they collide with the surface of the sample, the kinetic energy of the ions changes to the thermal energy. Hence the amount of material removing from the sample surface is greater than the amount of the material that is removed from the surface of the tool, therefore, by increasing pulse on time the amount of material removing (from the face of samples) increases and the amount of TWR decreases. 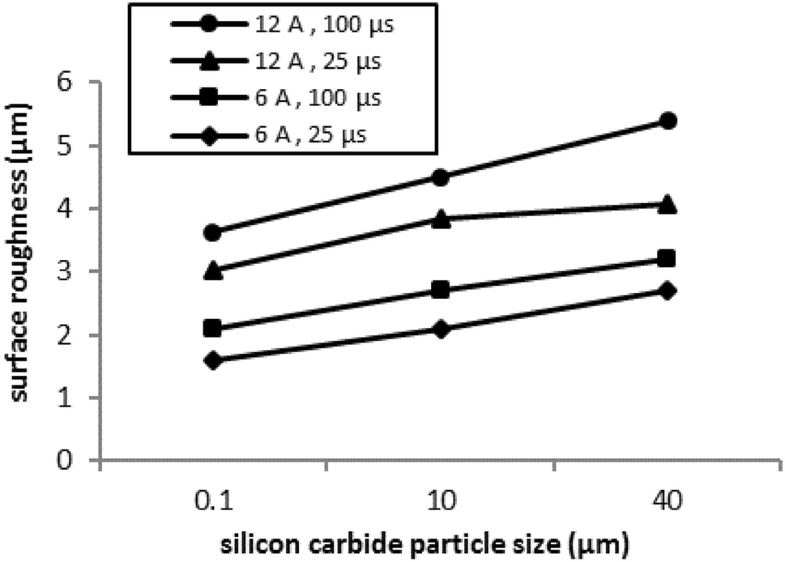 Figures 10, 11 and 12, show the SR of the samples versus the size of the reinforcing particles of composites being tested. 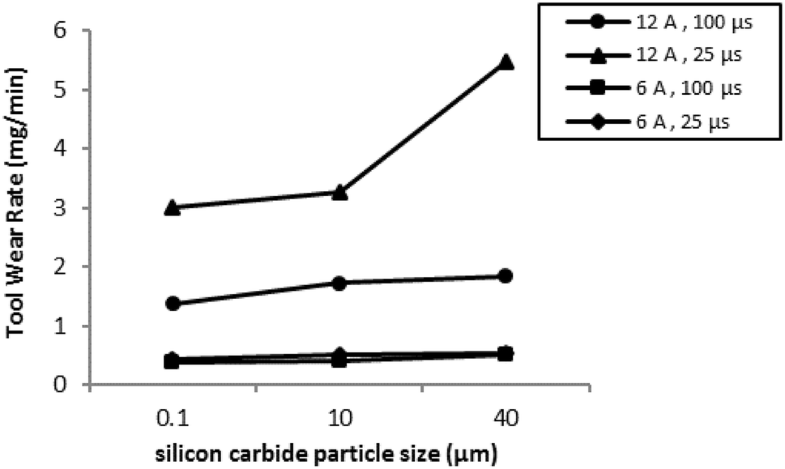 As can be seen, increasing the size of the SiC particles increases the surface roughness of machined specimens. The reason for this is the fact that in the process of EDM of base metal composites with reinforcing particles, while the reinforcing particles act as protective and prevent the removing the phase metal, by increasing energy due to an increased pulse current the sparks applied will be able to extract the reinforcement particles. With dig up of each of the reinforcing particles, the vacancy of each particle will remain as spot on the surface of the specimen. By increasing the volume fraction of the reinforcing particles, the presence of these particles would rise in the base metal, followed by the machining process, and by removing these particles, the number of pits created by the vacant space of the particles will increase. The presence of these pits will be the cause for roughness at the surface of the samples. 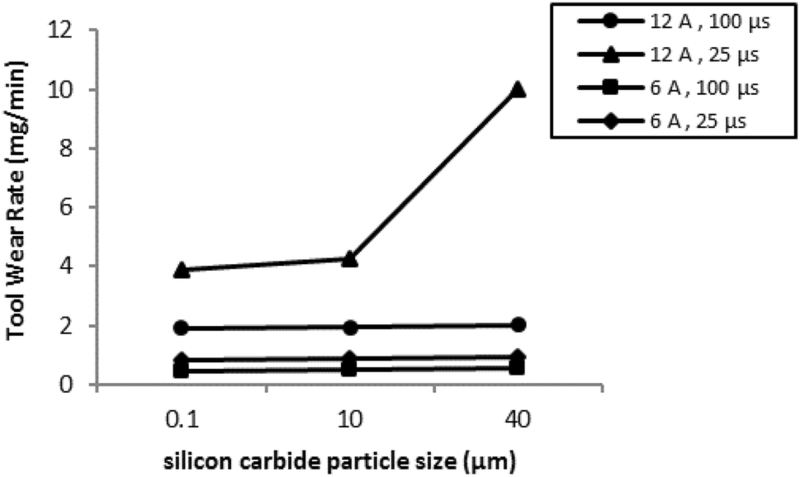 The larger size of particles will cause deeper and larger cavities on the composite surface and base metal that in turn will increase the SR of the specimen. In general, it has been observed that by increasing the volume fraction and also increasing the size of particles from the nanoscale to microscale, the surface quality of the machined surface has been deteriorated significantly . In other words, the surface obtained by machining of composites with small reinforcement particles has better quality and smoothness. On the other hand, Figs. 10, 11 and 12 shows that the SR increases with increasing pulse current. The reason for this is because of increasing the pulse current it causes to increase pulse energy, and as a result it finds opportunity and energy to dig up reinforcing particles from the surface of samples. Therefore, deeper cavities are created on the surfaces of the electrodes. The obtained results in this study can be summarized in the following paragraphs. As described in the previous sections, an increase in the production rate and reducing costs of metal matrix composites is achievable by consideration of dominant relationships between the parameters in the EDM. By decreasing the volume fraction of the reinforcing particles, the MRR would increase, and the TWR and SR would decrease. Because reinforcing particles in the base metal phase act as shields and protectors against sparks. 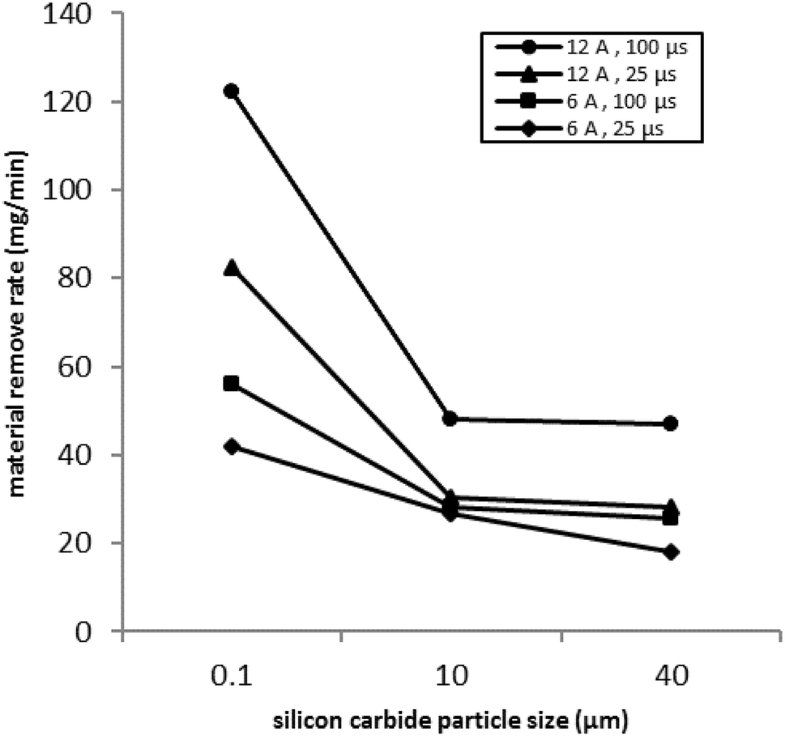 As a result, Low volume fraction of reinforcing particles lead to increase in MRR. By reducing the size of the reinforcing particles in nanoscale, the MRR increases and the TWR and SR will diminish. With increasing pulse current, the amount of MRR, TWR and SR increase. Therefore, also, it is necessary to be careful in choosing it, to increasing the removal rate and have a less adverse effect on tool wear and SR.
With increasing pulse on time, the MRR and SR increases but TWR decreases. Among the different machining modes, the minimum SR achieved at 6A current intensity and 25 μs pulse on time, with 100-nanometer particle size and 5% volume fraction.